Collecting all of the gems in the correct colour order (from left to right on the gem counter - RED, ORANGE, YELLOW, GREEN, LIGHT BLUE, DARK BLUE, and MAUVE) gives you an extra life and a Bonus Gem. It also grants you access to a magical secret room. When you reach the end of the level, a silver door appears so you don't have to fight the Boss! If you manage to unlock the silver door on the fifth island you will find a box in the secret room which you should collect. There's also a gate with a '7' on it, leading to island 7. With some practice you can control the colour a gem will be. The screen is split into several invisible vertical stripes of colour. When a gem falls, its colour is determined by the `colour' of the area into which it fell. Now all you have to do is gauge carefully where the dead enemy will fall to create the gem color of your choice. 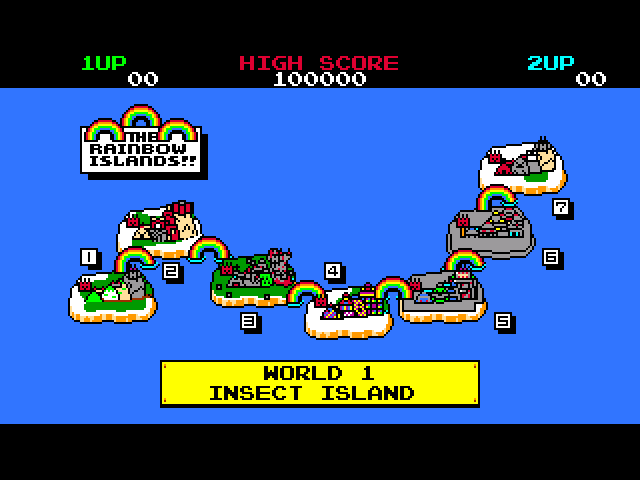 Rainbow Islands is the sequel to Bubble Bobble. 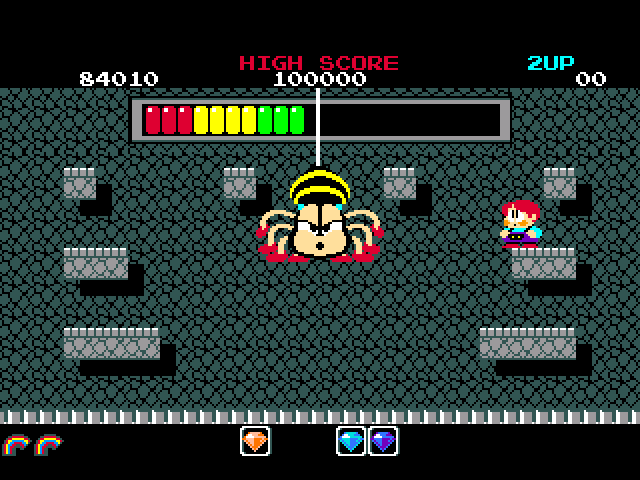 It's a platform game, where instead of moving across the screen, you climb up it. 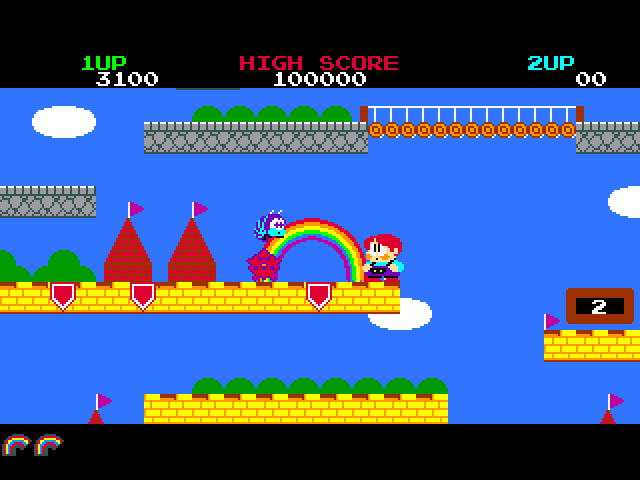 You can shoot rainbows to kill enemy's (themed to each of the eight worlds) and also to walk up the screen. Touching an enemy, or a bullet shot by an enemy results in the player losing a life and having to repeat the level. If an enemy is on screen for too long, it will become angry and speed up. 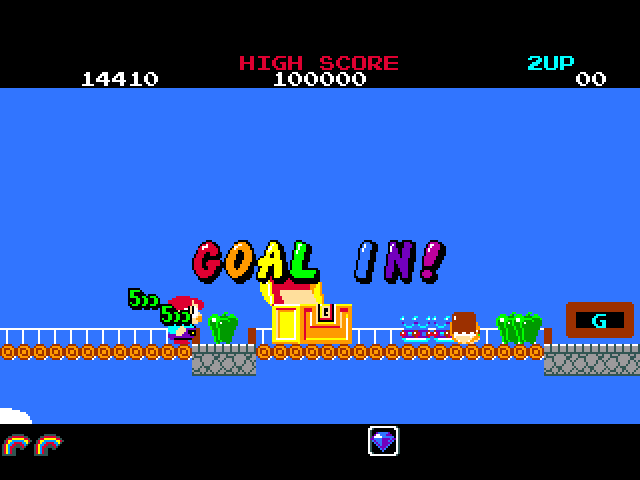 The story states that the islands are slowly sinking into the sea and as such should you spend too long playing a level, water will start to fill the screen and unless you finish it quickly you will drown. 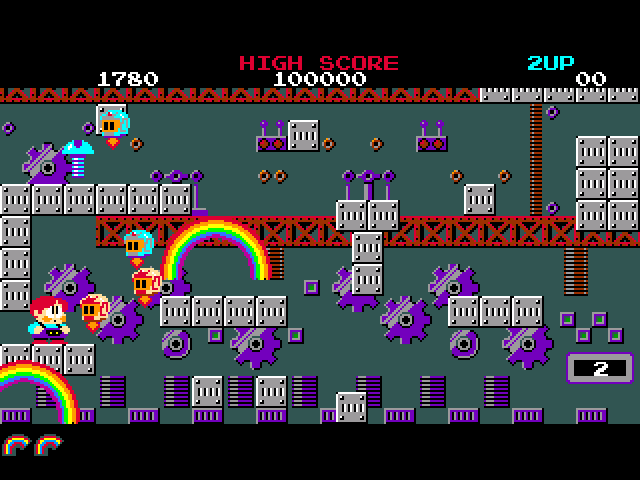 The gameplay while at first seeming fairly simplistic (shoot rainbows, avoid enemies, get to the top) actually has a large number of secrets for the player to discover which result in different events and even a different ending. Some of these secrets are extremely difficult to achieve. There are also loads of items to collect in order to boost your score. Some items will appear only if others have been collected or a certain goal has been achieved (e.g. enemies killed). Knowing how to obtain these items is the key to getting a massive high score. 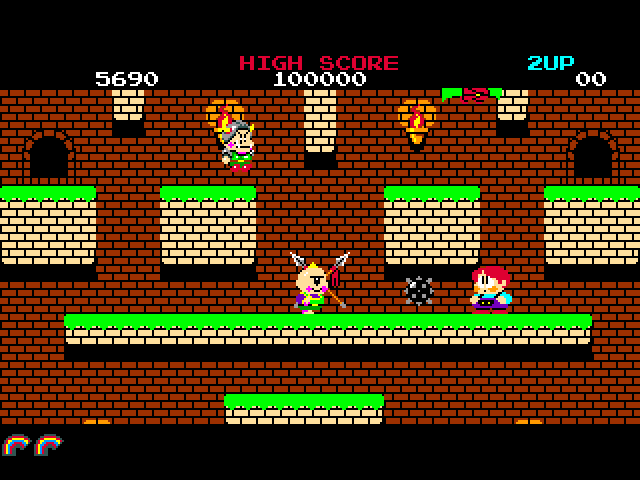 The graphics, are colourful and cartoony, and suit the game well. The music, a motif from "Somewhere Over The Rainbow" loops on every level and I found it really annoying after a while. The sound effects are nothing special but again fit the game. Being an Arcade conversion there was no passcode/save option, which lets the game down. 'Completing' the game without finding any of the secrets will take an experienced player at least half an hour, likely much longer. The frustration of reaching the 5th or 6th world only to run out of lives and go all the way back to World 1 is huge, and spoils the game slightly. Despite this, the game is extremely good fun to play, and the conversion from the arcade is well done. The amount of depth to the game, despite appearing relatively simple at first glance adds much replay value to the game. 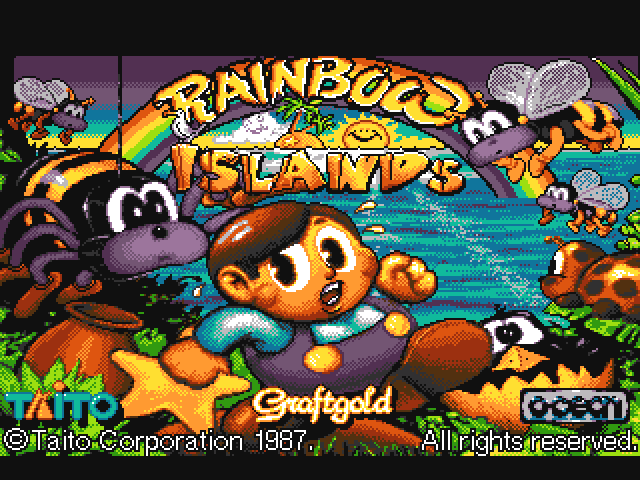 I've always found Parasol Stars better than Rainbow Islands, but that doesn't mean that this game isn't fun. It's a good platformer with plenty of action and stuff to do. 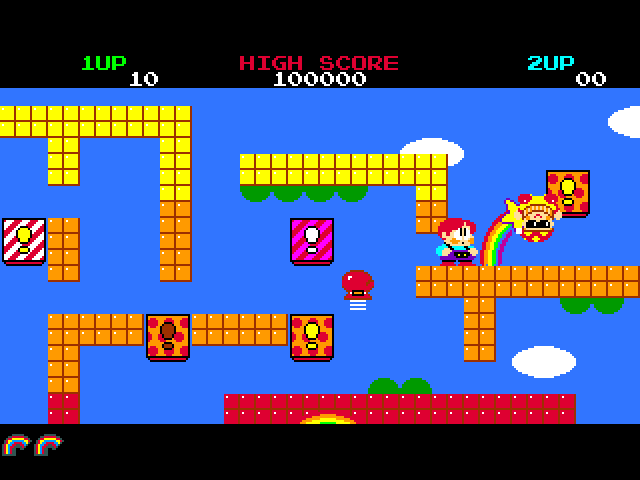 The one thing I miss most, which is included in Parasol Stars by the way, is a two-player simultaneous mode.